The Cuisinart CGS-5014 is a 14 Piece Deluxe Grill Set includes all the tools to make your grilling easy and fun. The durable stainless steel tool set includes a Chef's Spatula, Grill Tongs, Silicone Basting Brush, Cleaning Brush, Extra Cleaning Brush Head, and 4 Pairs of Corn Holders. Each tool boasts elongated handles and a hanging ring for ultimate grilling convenience. And when your grilling is done, the whole set stores in the durable aluminum case until the next time. 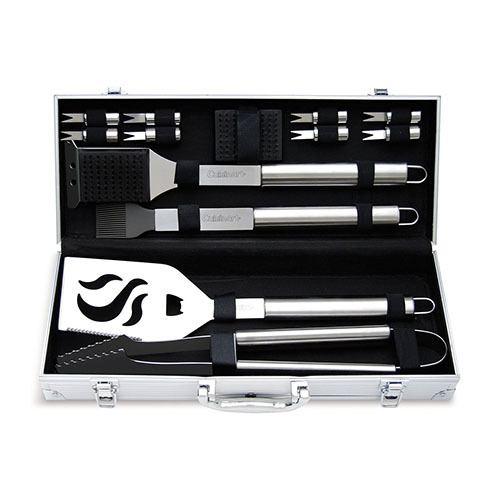 The Deluxe 14-Piece Grill Tool Set has many exciting features for users of all types. You can extend the lifetime of your Deluxe 14-Piece Grill Tool Set with the purchase of a FactoryOutletStore Factory Protection Plan. See the Deluxe 14-Piece Grill Tool Set gallery images above for more product views. 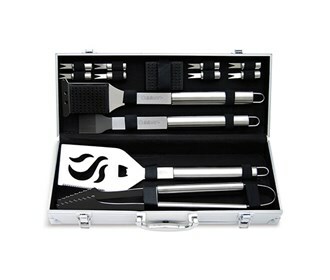 The Deluxe 14-Piece Grill Tool Set is sold as a Brand New Unopened Item.